Three of them were familiar to me: Ganesh the elephant god, Hanuman the monkey god, and Buddha. It surprised me to learn that some Hindus count the Buddha among their gods, whereas the Buddhists I know regard him as a human who, through meditation, succeeded in shedding the delusions that plague all humans. 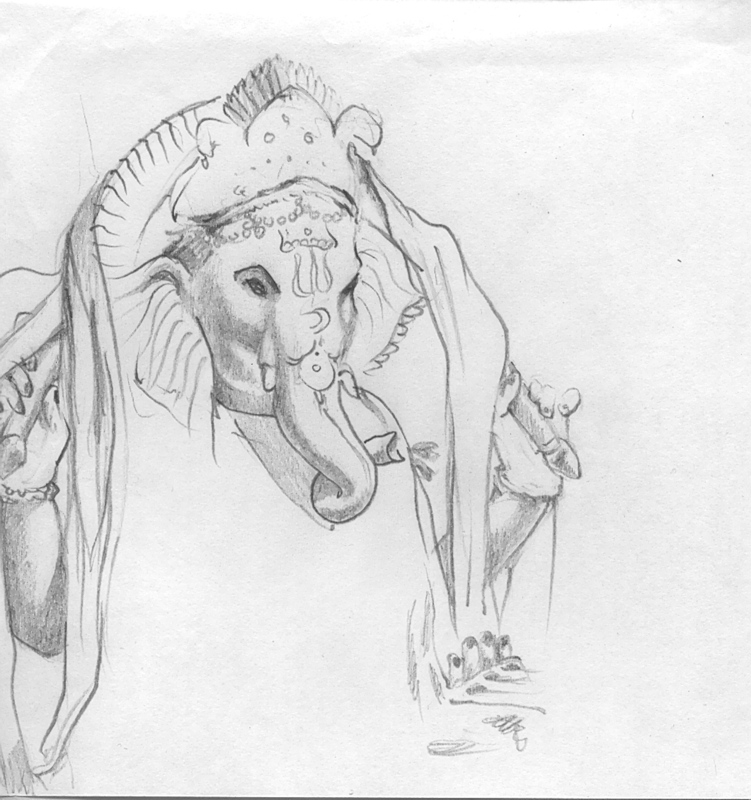 The chanting ended before I could sketch Hanuman’s cheeky face–or Ganesh’s fourth hand. I look forward to revisiting. It stumps me to think what the non-human elements of these gods might mean to Hindus–or what monkeys and elephants might mean in their culture, given their resemblances to gods. Light to shed on this, anyone? This entry was posted in Art and curiosities and tagged Buddha, elephant god, Ganesh, Hanuman, Hindu, Hindu Center of Greater Cincinnati, monkey god. Bookmark the permalink. Enjoyed reading the post. I live in Anderson and had no idea that the Hindu Temple of Cincinnati was located here. Must be a well kept secret! Loved your Ganesh drawing! The Hindu Temple is in Union Township, not Anderson, on Klatte Road. I grew up in the surrounding neighborhood and would often ride my bike there during construction. They hold a yearly Hindu festival in the summer and offer tours of the facility then (along with some great Indian food!). For more on elephants and other animals in Hindu culture, this is a good read. Hi, Enjoyed running across your blog through Twitter. We’re also both WordPress users. I practice meditation and chanting based on Hinduism and have also visited the Hindu Temple. It’s great! Last year, I was fortunate enough to make a trip to India. I can tell you that elephants are highly regarded and, although they would never harm them, monkeys are a nuisance. Maybe I should use the term ‘mischievous’ instead. Let’s just say, one stole a banana out of the hands of my tour guide. But, hey, she was in the courtyard of a temple and the monkey probably thought it was an offering! I’ve heard they’ll take anything–glasses, for example, but they will usually toss them aside if they’re not edible! There are fascinating stories about every God and one such story is for Ganeshji too. The story is about how Ganeshji got his elephant face. It’s a long story and I am not good at narrating stories as well, so to keep it short, I would say that during the time when God’s lived on earth (and heaven at the same time) they behaved like humans and the reason for Ganeshji getting his elephant face was his father’s anger and ignorance. Ganeshji and Krishnaji are my favorite Gods because my mom used to tell me many stories about them during my childhood days. When I learnt about various other religion and culture, I realized that many of our faith and reason to believe in a religion are more or less the same. The problem is in the way we portray our religion and for this reason we end up fighting to prove something which was never a part for any religion. first of all, really nice sketch. Very beautifully done. Wanted to share a little about the significance of Ganesha and Hanuman. Both gods originate from the binary of what they stand from now. Ganesha, who is now known as the “vighna-harta” (vighna = obstacle, harta = remover) was known in ancient times as the “vighna-karta” (karta = doer). In the olden days, elephants used to create a nuisance for travelers moving through forests – hence Ganesha temples were installed at the edge of forests so that travelers could pray for a safe passage. In the same tradition, Ganesha is still worshipped before commencing any task, be it an exam or a business venture. Hanuman, who is now known as the calm devotee of Lord Ram, was first mentioned in the Ramayan, and later in the Mahabharat. But once again, in the olden days, monkeys were known to not care for human gods, and plunder any unattended temples, especially the food that was offered to the gods. People were given to driving the monkeys away with sticks and stones. I don’t know exactly why, perhaps for better treatment of animals or something, monkeys became sacred and separate offerings were made for them at temples. Even now, monkeys are respected on holy grounds. In fact, a popular myth says that Hanuman is one of the 10 immortals (from Hindu mythology) still roaming the Earth. Hence Hindus tend to treat all monkeys as “possibly Hanuman” and offer fruits and stuff.